Most healthcare workers never stop to think about things from their patient’s point of view…thinking that everyone’s reality is the same as their own. But this may be a very inaccurate view of your patient’s daily experience! The first thing we have to understand is that if you are there, the patient needs help. If the patient was able to care for themselves, they wouldn’t need you! This means that they have some kind of impairment in mobility, energy, ability and/or thought processes. So, it becomes immediately apparent that they AREN’T like you – they have special needs. So, why does this matter? Because if we can somehow try to gain an understanding of our patient’s reality, we can be more helpful and provide safer and more compassionate care. Since you are probably not the same age as the patient, and you clearly have a different level of ability, this can be very difficult for you to visualize and understand. Energy is one such issue. You are probably younger and healthier than your patient, and probably take your own energy levels for granted. You get up in the morning, take care of your toileting needs, bathe, complete your grooming rituals, eat and transport yourself to wherever you need to go. You do all this without a second thought, because it is habit and you have ample energy to complete these tasks. But it probably won’t always be this way! As we age, our energy levels decline. We have a ton of energy when we are children, because we need excess energy to grow and develop properly. Have you ever seen a 2 year old? They will jump up and down for no reason at all; merely because they have excess energy. When was the last time YOU jumped up and down for no reason? Probably when you were two! But move forward in time to 12 years old. Sure, they have a lot of energy – but probably less than that 2 year old! Just ask a 12 year old to help babysit…they will be begging for a break before that 2 year old runs out of steam! Now think about 22 year olds. Again, a lot of energy, but not quite as much as a 12 year old. 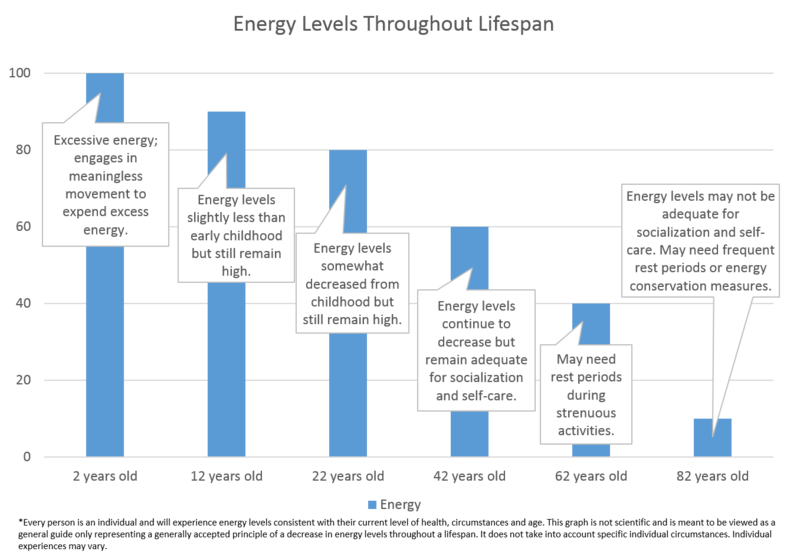 By the time we get to 42, our energy levels are nowhere near what they were when we were younger. Now, fast forward to 62…and 82. You can see how energy levels decline though life stages. Of course, everyone is different; you may know of an 82 year old that can run circles around you. But in general, energy levels decline. And they will decline further in persons who are ill or injured – which is usually the people that we are helping! So why does this matter? Think of it this way: everything you do takes energy. Eating, bathing, grooming, toileting, socializing, moving…even breathing! If a patient has spent all of his daily energy just getting up out a chair and walking to the dining room, he may not have any energy left to eat. With inadequate nutrition, he will have less energy tomorrow. Or maybe the patient won’t have energy to socialize, which leaves them feeling isolated and alone – this can lead to depression which can further affect energy levels. Or maybe they refuse to take a shower in the afternoon when they are scheduled, and you assume they are grumpy, mean and noncompliant (which they aren’t – they are just out of energy). It’s hard for us to imagine having such a small amount of energy to get through the day. We are young and healthy and have never experienced these issues…or have we? Have you ever had the flu? Laying around on the couch for 3 days, feeling horrible? Have you ever tried to take a shower and felt all of your energy just go down the drain? You end the shower feeling so tired, you don’t know if you can even dry off? And when you return to the couch, it takes you hours just to recover from that simple act of bathing? If so, you can now understand why some of your patients may refuse to shower because they simply “don’t have the energy”. So what can we do? Understanding your patient’s energy limitations is a great first step! Being compassionate and understanding, instead of harsh and judgmental is essential to establishing a good patient/caregiver relationship. But there are other actions we can take as well! Smart Scheduling: Schedule high energy activities during periods when the patient has the most energy. For some patients, mornings are their best time for bathing. Other patients may have greater energy levels in the afternoon. Get to know your patient and what works best for them. Frequent rest periods: Think of all you do in the mornings to get ready. It’s a lot of work! Your patient may need frequent breaks to get everything accomplished. Or, the patient may not be able to tolerate everything being done at once, meaning that daily activities must be broken up over a long period of time. Limit unnecessary steps: Simplify the tasks, whenever possible. You may be perfectly okay changing clothes three times before leaving the house, but your patient may not be able to tolerate that much activity. Small, frequent meals: By the time many patients make it to the dining room, their energy levels may limit how much they can eat. Small, frequent meals and snacks can be helpful in maintaining adequate nutrition when energy levels decline. Offer assistance: If you see your patient struggling to get out of a chair or walk down a hallway, offer assistance! By taking small steps to help conserve energy, you can make the patient’s stay more enjoyable and productive. Use appropriate aids: Gait belts, when used properly, are great tools that can assist you in standing and transferring patients and provide stability while walking. Using mechanical lifts, wheelchairs and other aids can also help conserve energy. Group related activities: If you are giving the patient a bed bath and also need to change the sheets, do it at the same time. Going into the room once to bathe the patient and later to change the sheets makes the patient move twice. Be patient! Patients with limited energy are going to move slowly. Be prepared for activities to take longer. Do not try to hurry the patient, or make them feel uncomfortable for taking longer to do an activity. Encourage self-care when possible: Even though it is faster for you to perform a skill yourself, all patients should be encouraged to perform as much of their own care as possible, to promote self-worth and discourage depression. Provide explanations: Explaining what you are going to do and how it will be done allows the patient to participate when able. If they are unsure what is about to happen, they may resist the care being provided out of fear or uncertainty. By acknowledging the specific needs of your patient, you can work together to take steps to conserve their energy. Understanding your patient’s energy limitations and the steps you can take to help them lead a meaningful life allows you to provide compassionate, dignified and appropriate care.